Awesome, awesome and another awesome is not even enough to describe this new destination and 4x4 tour. Mabenyani is a 4 million hectare private concession adjacent to Mabuasehube and the Kalagadigadi Transfrontier Parks. It is a true and one of a handful wilderness areas left in the world. Here you regularily see herds of hundreds of Eland, Gemsbuck, Red Hartebees and recently Springbuck in a herd of more than one thousand was spotted. Of the cats Lion, Leopard and Cheetah are the most common and a few Spotted Heyena also patrol the area. Until recently the concession was used for hunting and lion hunting in particular, but that activities was seized and it is now a photographic safari concession. To protect the true wilderness status of the area you can only tour the area with a guide and trackers. There is three magnificent camps scattered through the concession of which two camps are luxury, furnished tents under thatched roofs and the newest addition is a permanent thatched chalets, overlooking a waterhole. Because of the vastness of the area the tours are going to be 8-9 day tours, with camping in between the three permanent camps. 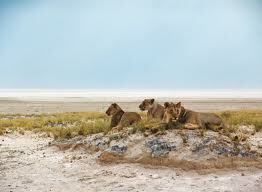 If you are a Kalahari, dune, savanna or Camel Thorn tree lover, you will enjoy this last wilderness in Africa. There is no locals or anyone living in this wilderness area and the tours are also planned, that you don't encounter any other souls, whilst touring the concession. There are only three tour operators(We are one of them) licenced to guide clients through this Kalahari Wilderness and you will have to book way in advance, if you measure this area against the popularity of the adjacent Mabuasehube.